Equipped with the new developed print head (6 print heads with 3 staggered configuration). 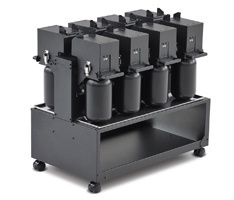 The JFX500-2131 is compatible with various UV ink types that have different characteristics. 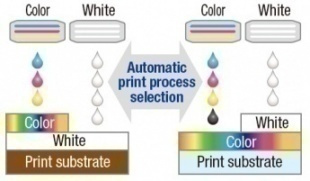 The optimum ink can be selected for intended applications. A flexible UV ink has 200% stretchability. One of ideal applications is a vehicle wrapping that requires excellent flexibility to apply print films. A flexible UV ink has 150% stretchability and would not crack during post print processes. This ink is compatible with a wide range of materials and has a low degree of tackiness. A flexible UV ink has 170% stretchability. Its ink film is very flexible and will not crack during post print processes. Hard UV ink with higher scratch and chemical resistance as well as color re-production on more rigid substrates. * LUS-150 ink set does not include clear ink. 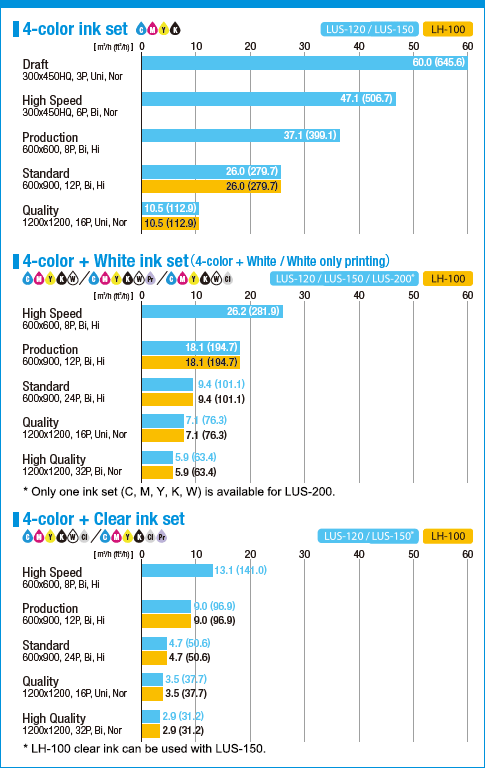 However, LH-100 clear ink can be used in combination with LUS-150 ink. * Primer is PR-100 or PR-200, no matter the ink type. * Installation of PR100/200KIT is required when using PR-100 or PR-200. * Ink flexibility of LUS-120/150/200 may vary according to the substrate, please verify your substrate in advance. The New UV LED unit is optimized and the curing efficiency of LED is improved enough to cure the ink. High speed UV printing is available with all the advantages of LED technology, such as long-life, energy savings, and lower heat generation (being able to print on a media which is easily deformed or discolored by heat). 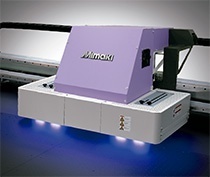 2 units of Mimaki's unique highly-accurate linear scales controlled by IMS have been equipped, for fine step accuracy and dot placement. This results in far less banding artifacts and even the possibility to print legible 2 pt characters. * Characters may be illegible depending on the media. In addition to the normal pattern, you can select "MAPSⅡ" that effectively reduces bandings. MAPSⅡ implements printing with generating passes, using a gradational mask pattern, the UV curing is performed more gradually and it diminishes the appearance of bandings. 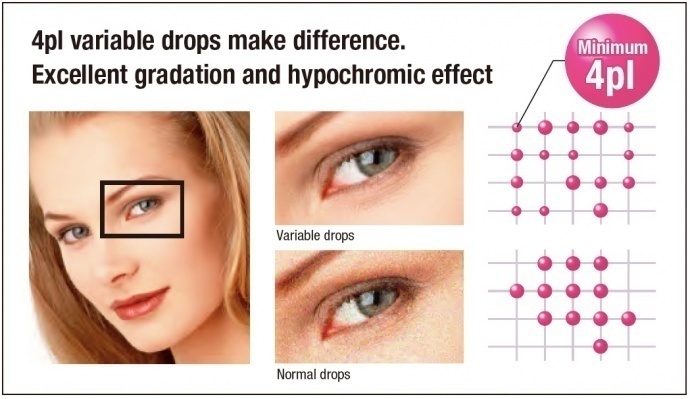 Variable drops function provides 3 different drop sizes at once. The minimum size is amazingly 4 pico-litter drop and produces smooth and natural gradation, without granular appearance even in the 4-color mode. 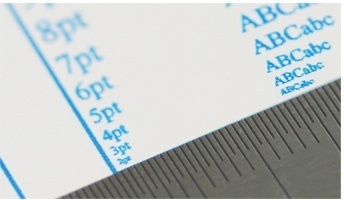 When placing a substrate on a flatbed, strict alignment had been required to check whether the media is not in-line with the printing surface, or whether the point of origin is aligned, etc. This machine is equipped with pins and a scale to eliminate such annoying aligning work. You fix the substrate to the pins and check the placement with the scale at first and then edit the design data or printer settings accordingly. In this way, you can implement direct UV printing without misalignment. Select the order of over- and under-print with white in RasterLink6, the bundled standard software RIP. The most efficient path is then determined by the software. Operators experience efficient high productivity gains without further operator intervention. 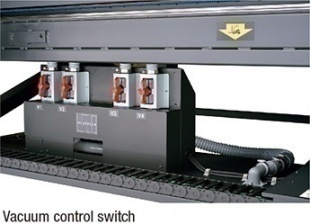 JFX500-2131 comes equipped with a vacuum unit to securely fix the substrates on the flatbed. It is also useful for preventing warpage of substrates during printing. The vacuum area is vertically divided into 4 zones and can be separately activated according to the substrates. 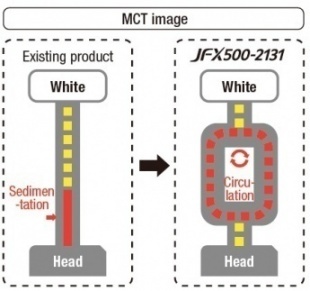 MCT to regularly circulate white ink is standard equipment. It enables stable output from the time of machine startup by effectively avoiding the settling of white pigment in the ink lines. Additionally, MCT contributes to reduction of ink waste, thereby supporting environmentally and economically friendly applications. * MCT works only with white ink. Without the nozzle recovery function, when printing and nozzle clogging or failure occurs that could not be resolved by the nozzle cleaning function, printers have to wait stop until the Mimaki service team arrives. When it comes to this function, even if nozzle washing has no effect on a troubled nozzle, the print image quality can be retained immediately without slowing down the print process. * The recoverability of this function is limited. UV curing printing is an ecological printing method that hardly generates VOCs. Curing efficiency of the newly developed UV LED unit has been improved compared to that of the conventional one. It is powerful and reduces power consumption while offering much longer life cycles and increased operability. Each UV ink is supplied in high-capacity bottle. This economical and ecological package contributes to reduce amount of industrial waste and running cost. High performance software is sometimes difficult to use, we make it easy! The new RasterLink6 is focused on being simple and friendly. With its many new functions, the “Software RIP for Everybody” has been achieved and provides for more professional and advanced finished products through its universal accessibility. Supports the Web update function that has been well-received in RasterLinkPro5. Program update and profile download can be easily performed via internet. MDL Command SDK Download Site is now available! : Mimaki IoT "Digital printing connection"
Mimaki IoT introduces "Digital printing connection"